Want a classy yet practical addition for your bedroom? Look no further than the ‘BedShelfie’, a shelfing system that is as adorable as it is convenient. Featured in the likes of Business Insider and Country Living, the BedShelfie redefines minimalism and small space living. Handcrafted from eco-friendly bamboo, each shelf sports an elegant, Scandinavian design with two slots for charging your electronics. The build is solid and sturdy, capable of holding weights up to 15lbs. 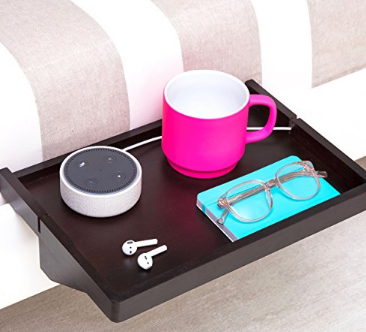 On days when you’re feeling particularly lazy and don’t want to get out of bed, the BedShelfie becomes your best friend, easily holding your mobile, tab or laptop, the TV remote, your favorite book, and your coffee mug, ensuring you don’t need to leave the soothing cocoon of your bed. The shelf comes with a 2.25-inch adjustable clamp that attaches to the bed frame. Thick padding covers the touch points to prevent marring or damage. No external tools are required for assembly. The BedShelfie is the perfect companion for folks looking for a minimalist, sustainable, yet modern approach to small space living! Get on here at Amazon!